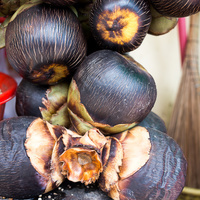 Widely cultivated in Asia for its sweet sap and coconut-like fruit, this palm originates from a vast area extending across India, Southeast Asia and the Pacific. Individual palms are commonly 15 and 20 m (50 to 65 ft) tall, with exceptional specimens reaching heights of up to 30 m (100 ft). It develops a typical tall-palm shape made up of a long slim trunk with smooth ringed grey bark and a compact, rounded crown of green fan-shaped leaves. The flowers are greenish-yellow, small and insignificant, with female and male flowers carried on separate individuals. 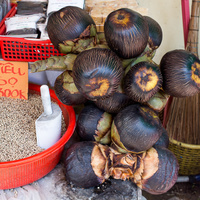 They are followed on female palms by coconut-like fruit that mature to a similar size, though are noticeably different in colouration to coconut, being two-toned with a small green cap on the part closest to the stem, and the rest grey brown to dark-brown. 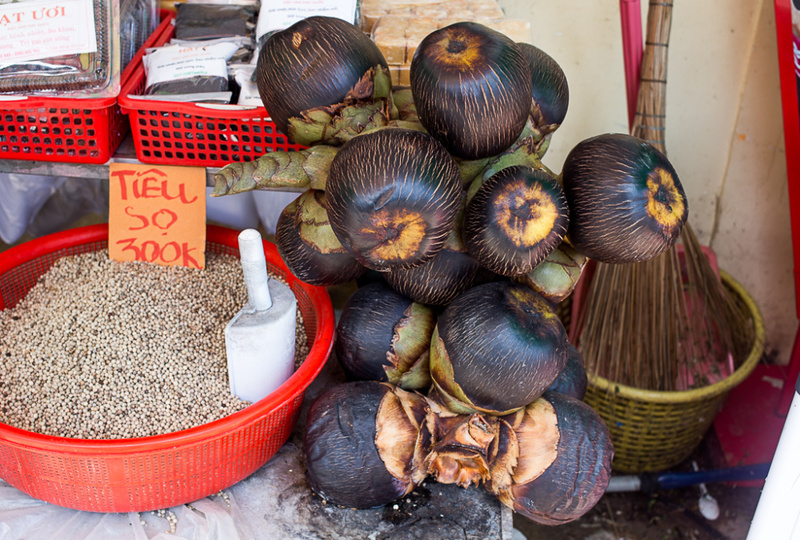 Sap tapped from the inflorescence at the top of the palm is boiled and reduced to produce palm sugar, a crystallized sugar commonly used as a sweetener in India, Sri Lanka and Southeast Asia. 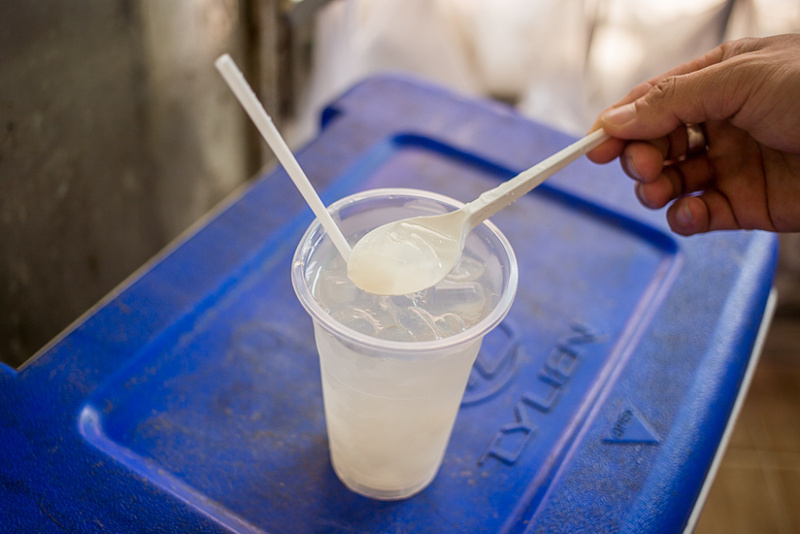 The sap is also fermented to make palm vinegar and toddy, a widely consumed alcoholic beverage. 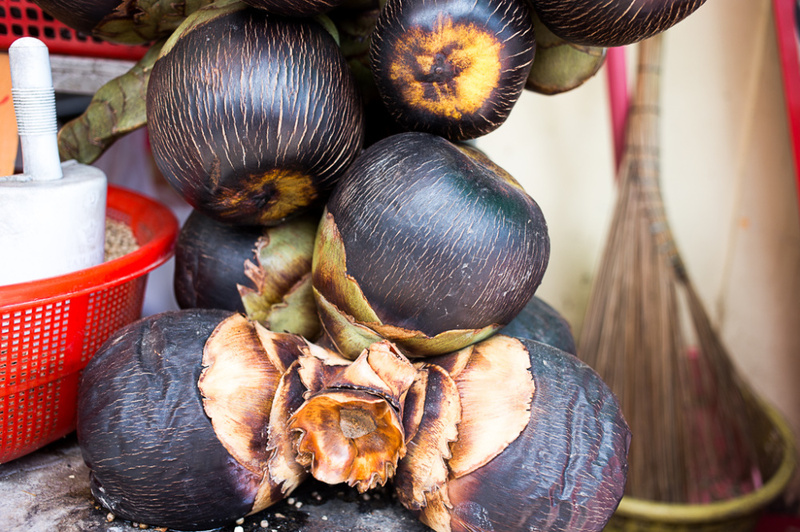 Tapping the palm for its sap can begin when it starts to flower, at around fifteen years of age and it is tapped thereafter over a four to five month period each year, until the end of its useful life. An individual palm yields between five and ten litres of sap per day, with female palms typically yielding about fifty percent more sap than male palms. 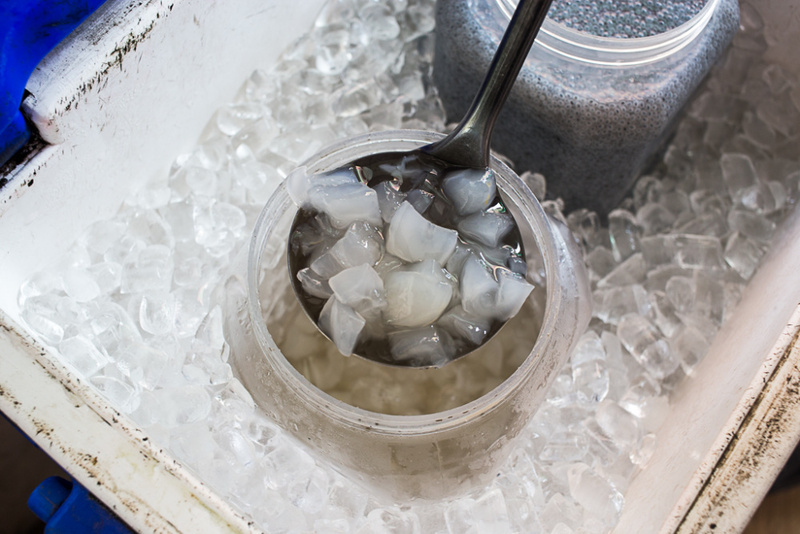 The immature fruit contain up to three translucent, jelly-like kernels that are filled with a sweetish water. 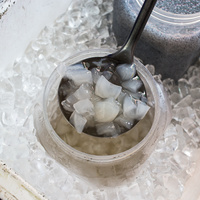 These are mostly eaten fresh, usually in a drink with ice. 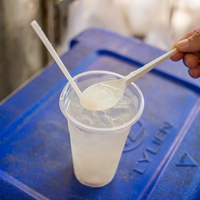 It is a common street-food in Southeast Asia. The leaves are woven into craft, especially baskets, bags and hats. Fibre stripped from the leaf-base make good bristles and are used in the manufacture of brooms and brushes. Wood sawn from the trunk is known as 'Black palm wood', a heavy wood averaging about 900 kg per cubic meter (56 lbs per cubic ft). It has attractive light and dark brown streaking and is used for furniture, flooring and turnery, especially for making walking sticks, knife and tool handles. Its durability varies considerably, depending on the part of the trunk from which it is taken, ranging from low to high natural resistance to rot and decay. Grows naturally in moderately humid subtropical and tropical lowland climates, generally in areas with annual lows of 18 to 25 °C, annual highs of 27 to 36 °C, annual rainfall of 700 to 4000 mm and a dry season of 3 to 8 months. New plants are usually grown from seed, with both male and female plants needed to produce fruit and set seed. It performs best on free-draining, clay, loam and sand soils of a slightly acid to slightly alkaline nature, generally with a pH of 6.5 to 7.5, and on sites with full sun exposure. Once established it has a good tolerance of drought, seasonal flooding, saline and generally poor soils but is intolerant of permanently wet or waterlogged soils. There does not appear to be any records of it escaping cultivation and naturalising anywhere, despite its introduction into areas outside of its native range. It is assessed as a low weed risk species for Hawaii by the Hawaii Pacific Weed Risk Assessment project (HPWRA). The pollen released by male plants is wind-blown and is known to cause a severe hay-fever response in some people. Martin, F. M., et al. 1987, Perennial edible fruits of the tropics : an inventory, U.S. Dept. of Agriculture (USDA), Agricultural Research Service, U.S. Government Printing Office (GPO), Washington, D.C.
Dagar, J. C. & Singh, G. 2007, Biodiversity of Saline and Waterlogged Environments: Documentation, Utilization and Management, NBA Scientific Bulletin, (9), 78. Seth, M.K 2003-10-01, 'Trees and their economic importance' The Botanical Review, vol. 69, no. 4, pp. 321(56).